N.B. Your new Visa will now include a photograph uploaded at the time of application at Visa centre. 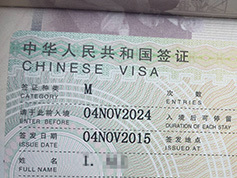 Business Visa (M-visa ) is issued to a foreign citizen who is invited to China for visit, research, lecture, business, exchanges in the fields of science, technology, education, culture and sports, or attending various kinds of trade fairs or exhibitions, or short-term study, intern practice for a period of less than 6 months. 5. Applicant who has obtained Chinese visa before is required to provide photocopy of the latest visa and an applicant who applies for multiple-entry visa is required to provide photocopy of previously obtained multiple-entry visa if obtained before. Business invitation letter issued by a mainland Chinese inviter. It should on a Chinese company’s letterhead, with full address (should be in mainland China, Hong Kong address is not acceptable), company stamp, contact details. Within the content, it should include the travellers’ FULL name, including middle name, Passport number, purpose of the trip, and duration of the trip. It should be the original copy, or scan/copy, we can NOT accept e-mail format. Issued to a foreign citizen who is invited to China for research, lecture, business, exchanges, trade, fairs, or study. Tourist and family visit visas are issued to foreign citizens for tourist purposes, family visit or other personal affairs. Download Chinese Visa Application Form for All Applicants. No queues or appointments required. Prices from £90. © 2015 China Holidays Ltd.